This was the cheapest ornament he could find in the gift shop. However, it glittered and looked huge. So, Larry took it home. Mary looked at the ornament with shining eyes. She dangled it lovingly on the Christmas tree. Everyday she went over to the living room to check if her precious glittering ball was still there. She touched it and even kissed it when she thought no one was looking. Larry noticed everything and felt envious of the ornament. He started buying expensive designer ornaments for the tree. Larry even went around decorating the house with lights and got a new Christmas tree. He decorated the tree with all ornaments, except the cheap ornament. Next day, he found it in a prominent place on the tree. Hey Padmini. How are you doing? Have you had a good Christmas? Christmas gifts are always special:) What did you get this year? Good story. Very fitting for this time of year. Yes I am and hope you are too. There’s new challenge starting today the Chain Writing Game. I participated and hopefully it will get me back in FF and Al’s Photo Fiction. 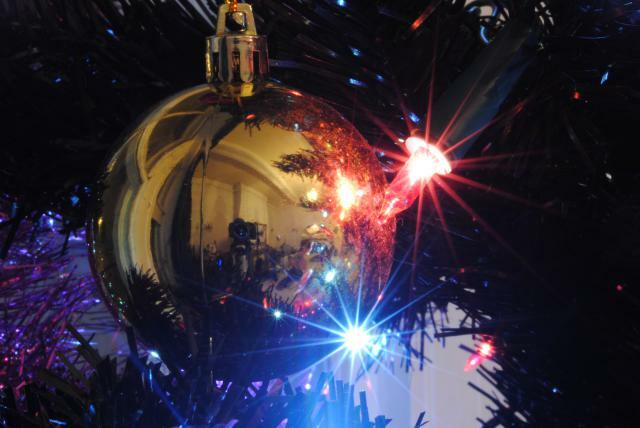 Poor Mary – a cheap tinsel – and after 25 years! Larry obviously doesn’t have the spirit of Christmas within – perhaps, it should be ‘poor Larry’ instead! “There are none so blind as they who will not see” – a beautifully unfolded story. Much enjoyed, thank you. and clear your head before writing. I have had difficulty clearing my thoughts in getting my thoughts out. to 15 minutes are wasted simply just trying to figure out how to begin. Any suggestions or hints?